Prof. Dr. Markus Mühling, geb. 1969 promovierte 2000 zum Thema „Gott ist Liebe. Studien zum Verständnis der Liebe als Modell trinitarischen Redens von Gott“. Seine Habilitation zum Thema „Versöhnendes Handeln – Handeln in Versöhnung. Gottes Opfer an die Menschen“ schloss er 2005 ab. Von 2007–2011 war Mühling Heisenbergstipendiat der DFG, zwischen 2009 und 2010 Gastprofessor für Systematische Theologie an der Universität Aberdeen (UK). Seit 2011 ist er Professor für Systematische Theologie und Wissenschaftskulturdialog an der Leuphana Universität Lüneburg. This volume contains the results of research into the dialogue between theology and biology, particularly neuroscience and evolutionary theory. With regard to neuroscience, the representational paradigm is abandoned in favor of the ecological brain theory, which understands the brain as an organ of resonance between the living body and its surrounding environment. In relation to theological epistemology, this account not only leads to fruitful convergences, but also shows that revelation, as perception of God’s triune presence in creation, has to be understood as a resonating and non extra-ordinary or general kind of perception, instead of being a special interpretation of experiences that are beyond the ordinary. With regard to the theory of evolution, the Neodarwinian paradigm is expanded with the help of the theory of niche-construction, in which the relationship between organisms and their environment is understood to be reciprocally resonating. 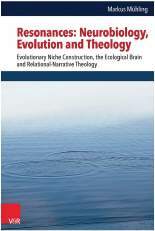 This new and emerging paradigm in biology fits to a relational-narrative theological ontology, in which the relationship between the life of the triune God and creation can be modeled on basis of the key metaphor of niche construction understood as a reciprocally resonating dramatic coherence. Theologically, Markus Mühling presents a theory of revelation as perception and a relational-narrative ontology based on the concept of dramatic coherence, in which the triune life is understood not as an exception to ontology, but as the decisive condition of its possibility. For neuroscience and evolutionary theory it provides the insight that taking the concepts of internally related external relata and a phenomenological approach into account leads to new horizons for solving those problems seen in certain older paradigms as posing irreconcilable contradictions. Mühling also argues that a dialogue between theology and the natural sciences – in order to be fruitful – must be maintained in relative dependence and independence, that any such dialogue must take philosophical considerations into account, and that it is decisive for each of the dialogue partners to speak on behalf of their proper and particular areas of research. The proposed results also reflect the author’s participation in the dialogue between leading theologians and scientists at the Center of Theological Inquiry, Princeton (NJ) on Evolution and Human Nature in 2013. Markus Mühling zeigt auf, dass sich in neuen naturwissenschaftlichen Ansätzen (Theorie des ökologischen Gehirns, Theorie der evolutionären Nischenkonstruktion) Resonanzphänomene erkennen lassen, die mit theologischen Ansätzen korreliert werden können. Der Autor entfaltet dies im folgenden Videointerview.